So I was supposed to go to this "best of the best" models workshop so that I could do some shooting, but the model got too drunk and forgot to email me the address. Nice, huh? Ah well. I stayed home and browsed around the forums until I found a retouching offer saying "Here is a Raw file, Have fun!" So I decided to play around. 12-14 hours later I have this monstrosity... and I am only about half way done! I just thought I would post a WIP to let people know I am still alive. On a lighter note, I thought about putting together a poster merging the two to try to get a character from a comic I like called "Transmetropolitan" where a bankrupt alien race sold us the technology to splice our DNA with other creatures. 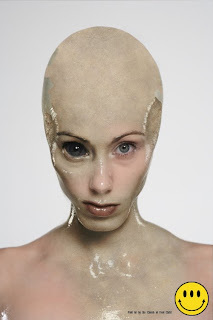 The humans who wanted to splice their DNA with the alien culture were called "transients" and in the book there are many of these people in various stages of their transformation. This is supposed to be one of them. I showed the pic to Ark and his reaction was... "So they're making a movie?"